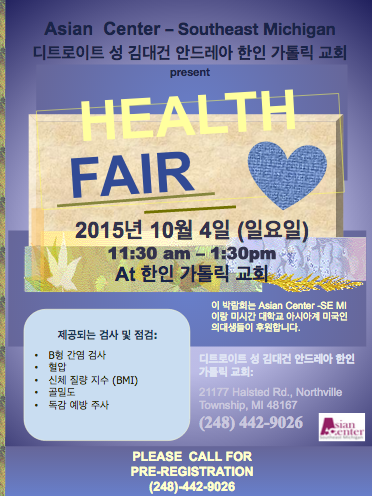 Please come out to our Korean Health Fair held at the St Andrew Kim Korean Catholic Church (21177 Halsted Rd, Northville Township, MI 48167) on Sunday, October 04, 2015 from 11:30 am – 1:30pm. 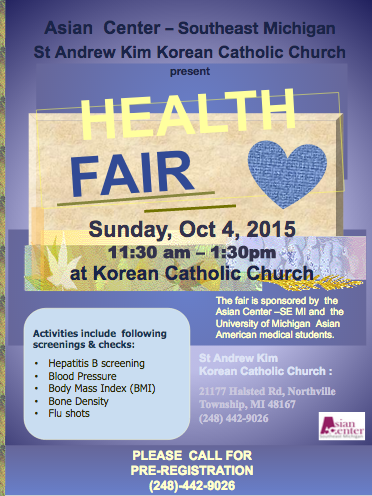 The fair is sponsored by the Asian Center –SE MI and the University of Michigan Asian American medical students. Thank you and hope to see you all there! Till then, stay happy healthy.